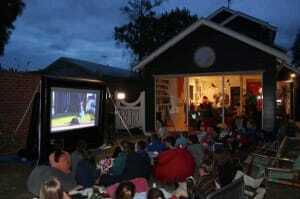 Family movies in your own backyard are simple ways to enjoy your family and transcend all generations. From little Johnny to teenager Beth to grandma Suzie, your family will enjoy a night spent under the stars watching a family movie in your backyard anyday of the week. Be sure to add popcorn, punch, cookies, and fruit for a time of fun and snacking. Whether your family finds fun excitement in good old fashion flicks or prefers action and adventure these recommended flicks are sure to satisfy even the most challenging cinema palettes. Happy Feet was released in 2006 by Warner Bros. The story centers on a young penguin born into a world of singing Emperor Penguins. The challenges arise when the young penguin is found to not even be able to hold the most simplest of tunes. He cannot sing and can barely hum. Your family will enjoy a movie about coming of age and discovering that sometimes what we have in common with our family is not the obvious but rather the less tangible things such as love and passions. How to Train a Dragon covers the ups and downs of growing up and accepting our born into privileges that seem to collide with our independent selves. A story of family and uncommon friendships makes this a family hit to cherish and watch time and time again. With its touches of fantasy and beautiful graphics your family will fall in love with dragons, vikings, and the magic of family and friendship every time you put it up on your inflatable big screen. A movie about loyalty and living after we have lost a loved one that will never grow old. The soundtrack has won numerous awards and the African scenary will display beautifully on your backyard inflatable screen. For a family movie that will bring tears, smiles, and laughs play The Lion King. You family will likely sing along and forge an unexpected loyalty to Simba. A brief history lesson will be in the making if you put this on for your family. It is a movie about hope, uncertainty, friendship, and respect. A young boy learns to love an unlikely friend and discovers true love and compassion through a journey that will touch your family’s heart and stir up loyalties to what you believe. Finding Nemo is about consequences and the choices we make. A story about self discovery and the people and things along the path to finding who we are can be scary and entertaining at the same time. While a little fish struggles with growing up and fumbles around learning to be brave your family will find themselves falling in love with all the wonderful characters he meets along the way.